Many old fringed lampshades that have been in storage for any length of time have had their fringes consumed by rodents, moths, or other fringe-eating animals. 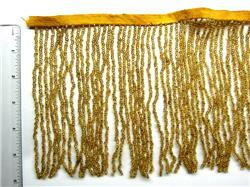 Whether for replacement purposes or for new work, our beaded fringes are unsurpassed for quality and rectitude. They are made of the finest glass beads available for the purpose intended. 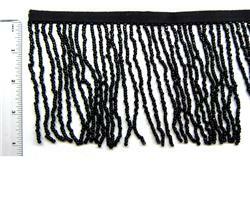 Our supplier of fringes is one of the most respected purveyors of these products. 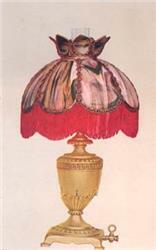 By appointment by Her Majesty, this firm supplied all of the beaded fringes for the Royal Bordello. The beaded fringes come attached to a band of cloth tape which can be cemented to the edge of the shade, although sometimes you may attach it mechanically using wires and solder. 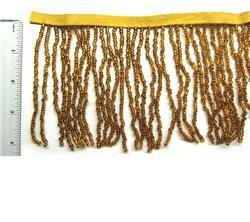 Measurement of fringes are for the length of the beaded portion only and do not include the 1/2" cloth tape. There are approximately 5 strings of beads to the inch.